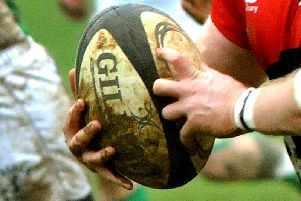 Olney suffered defeat on their first away day of the season, going down to Oundle 34-5. Almost immediately, Olney were on the wrong side of the referee, earning a team warning for being offside. After an early penalty for the home side to move 3-0 up, Olney’s Dave Smith was sent to the sin bin, allowing Oundle to take an 8-0 lead. But his afternoon got even worse when he returned to the field as he was penalised once again, this time for a high tackle, earning him a red card and an early bath. A penalty in Oundle’s favour was put into touch on the visitors 5m line and this enabled the home side to break the Olney defence after 46 minutes, to add an unconverted try taking the score to 13 - 0 at the interval. The second half continued in the same vein, with Oundle running in three more unanswered tries to open a 34-0 advantage over the visitors. While the referee continued to penalise Olney throughout, they finally got themselves on the scoreboard late in the day..
From a knock on by Oundle in the visitors 22, Olney won the scrum and attacked, involving forwards and the try came as prop forward Jeremiah Shields touched down. Next week, Olney take on Peterborough at home.